This little painting is up for auction until 10PM UK time on the 10th October. So I spent much longer than usual on the drawing out and underpainting stage. With a combination of painting, rubbing out with turps and sanding back, I finally arrived at what I thought was a good value balance. I also spent a lot longer than usual trying to make sure everything was in the right place. The perspective was tricky too. I deliberately left that right vertical at an angle, because I wanted to emphasise the immediacy of the impression, as if you’d just turned around and noticed this little jug hiding in the shadows. A lot of my work has a feeling of quiet. I have a feeling that might just be because that’s when I’m happiest: n peace and quiet, just getting on my work. So that’s where the title for this piece comes from. I hope that, despite the amount of time I spent working on it, it keeps some sense of immediacy and informality, perhaps spontaneity. To handle the values, I keyed everything down from the highlight on the jug. I also established my darkest darks early, and tried to keep my mid values true to the subject. The lights are mostly painted opaquely and without medium. The darkest shadows were built up with two or three glazes, using Natural Pigments Balsam essential oil medium. Since I’m working on a rigid panel, it should be safe from future cracking. I also use very little of the medium. I think sometimes, when people glaze, they use a lot of medium, maybe too much. The way I use it is to get a little on the end of my finger and spread it out as thinly as I possibly can on the panel.Then I paint into it. You can also paint soft edges out over a dried later this way. And when the painting is finished, the overall effect is fairly even. this painting, perhaps more than most I do, will benefit from a good quality varnish in a few month’s time. It will really bring out the luminosity of the darks and the chroma of the strong reds in the apple. 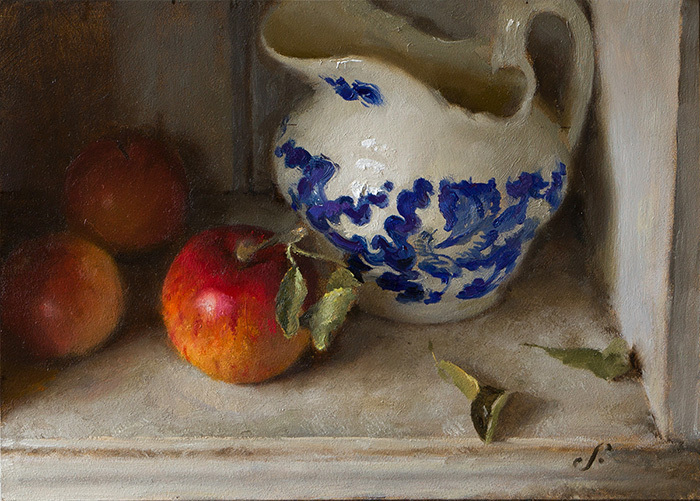 Hi Paul, I really love this little jug and apple still life painting. Everything seems right to me, from edges to values and especially the tricky but effective perspective you chose. I guess I’ve never seen you paint anything other than studies before, so my question to you is; do you usually paint a grisaille first? I can see how this might make controlling values later when working with various hues, but does this method change the pigments you use as far as transparency is concerned? I am always afraid if I use this technique, the chroma will drop. Well, I wouldn’t call this a grisaille, to be honest, I’d just call it an underpainting. The reason I don’t think it’s a grisaille is that there’s no white, it’s all wash with varying degrees of transparency. This is the method I usually use, I just took it much further with this one than I usually do – I think partly because I was just enjoying it! Underpainting like this doesn’t affect the chroma at the end, no. The lights are painted opaquely over it so none of it shows through, really. Maybe the odd touch but not much. In the shadows, I’ve glazed over the underpainting so I think the chroma would be slightly higher there than if I’d painted them opaquely. 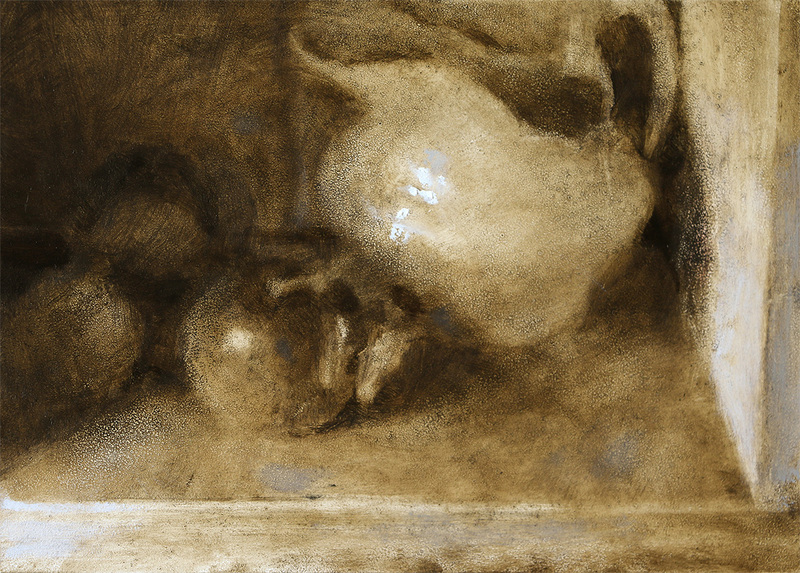 The only time I could imagine a full grisaille being useful is if you were going to add the colour by glazing. No argument with that of course, but for me I’d be concerned that my colour would be less accurate, and also it seems like a lot of work for something you’re going to cover up! Beautiful Paul, so much going on and still so peaceful and balanced. Bravo! Paul, this is great. One can just reach for the waiting forgotten jug. A good reminder of how important underpainting is. Beautiful new work, Paul. Strangely, I did not know previously that you use an indirect, underpainting technique. I have done a little of this recently, and am beginning to see the value of it (no pun intended). Many thanks again for the links you sent two weeks ago. I knew the fundamentals of Munsell, now it’s just a matter of applying the principles and actually matching colors from still-life to canvas. (Also I found the info on Rublev Medium very interesting…it is rather pricey but I will keep it in mind for the future).